I remember when Cape Cod potato chips came out. I had never had kettle cooked chips and thought they were too hard and tasteless. But I eventually grew to enjoy(?) them. 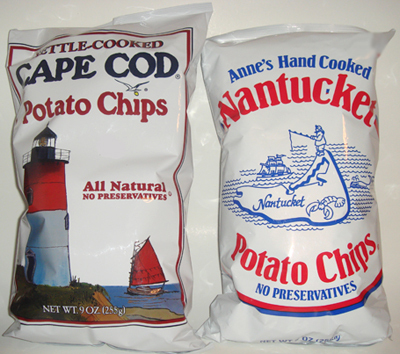 I’m not too familiar with Nantucket chips but they’re the same style chip and just a ferry ride away from the Cape, so it made sense to compare. These are light in color and, like all chips do, crumble when bitten into. But the kettle cooking must do something to make these extra crunchy, which normally I like, but it’s a harsh crunch. Not terrible, but not as comfortable as a Wise, Lays or Ruffles chip. We found these to be salted proportionately and to have a very mild potato taste, which makes these good for dip since they would let the flavor of the dip shine on it’s own. These have even more of a hearty crunch, which I’d go so far as to describe as severe. Another difference we noticed was how oily they were. It was almost like oil came out of the chip when bitten into. We noticed there was really no detectable potato flavor, and these were definitely saltier as well. Ethan described them as just “crunch and salt”. Interesting how two chips that are so similar in appearance definitely have their differences. At the time we felt maybe Nantucket was too crunchy, too oily and too salty yet that bag is gone now and there are plenty of Cape Cod chips left. Ethan said he might have liked the Nantucket more because of the saltiness. I’m still not a huge fan of this style of chip in general, but I used to really like Cape Cod’s Dark Russet variety, but then they changed that to “Robust Russet” which weren’t as dark. Anyway, I’m inclined to say Nantucket is the better of these two. Cape Cod or Nantucket chips? I’ve never heard of Nantucket chips, but I’ll be on the lookout. I’m a big fan of Grandma Utz’s Handcooked Potato Chips. Based on your description, they sound a lot like Nantucket chips. I love Kettle chips! 🙂 Nantucket sounds nice, though i can’t handle alot of grease. Both of these chips are to greezy for my tastes. Then again, I am a fancy gentleman.